Michael Carlson has fond memories of spending time at the University Club, where his late uncle, Ralph Bartels, was a member. Ten years ago, Carlson followed in his uncle’s footsteps, becoming a member of one of Rockford’s oldest clubs; now he is president of that club, in its 100th anniversary year. That seems to be the consensus among the club’s 400 members. The University Club is located at 945 N. Main St., in an old Victorian home nestled along the Rock River, not far from downtown Rockford. 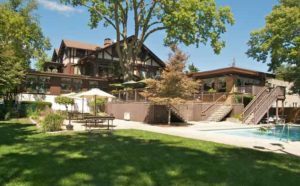 The renovated headquarters has a cozy library, spacious dining room and living room, intimate bar area, backyard swimming pool and the only known squash court around. “It’s a great setting, but somewhat of a hidden gem,” says Kurt Schiffer, general manager. “It’s amazing how many people don’t know it’s here.” Annual membership dues are $1,100, with a one-time joiner fee of $750. This year, in celebration of the anniversary, the joiner fee is reduced to $100. A new member must be 21 years old and sponsored by a member in good standing. According to club records, several men, led by Mr. Warner Hays of Chicago, arrived by horse and buggy and formed a University Club in Rockford in the early 1900s. It officially opened in 1911 as a place for college and university graduates to nurture ties to their alma maters. The first annual dinner was held Feb. 3, 1911, in the “new” Mendelssohn Hall, located on North Main Street. Early on, club members met in a variety of places: the Christian Union Church; the Elks Club; the Trust Building; and the Lafayette Hotel. In 1928, the University Club moved into its first home, on the second floor above the F.W. Woolworth store. Three years later, it relocated to the top floor of the then-newly-completed Gas-Electric Building. It moved to its current location, the former home of Duncan Forbes, in 1940. Forbes was board chairman of the Gunite Corporation in Rockford. 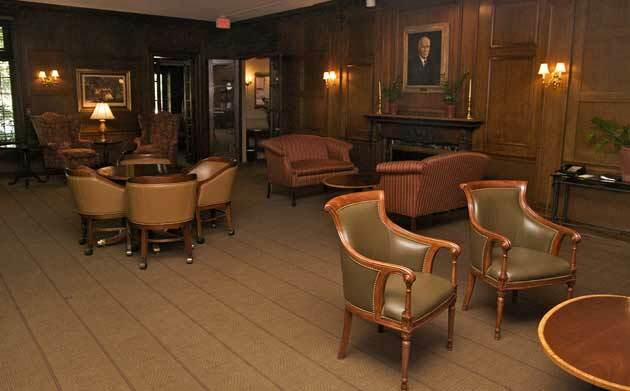 Today, the U Club, as members call it, counts bankers, lawyers, physicians and retired executives – both male and female – among its many constituents. Even rock star Rick Nielsen of Cheap Trick pops in from time to time. Naturally, the club has seen a lot of change during the past century. In 1982, for example, members welcomed into their fold the Mid-Day Club, a downtown luncheon club. But the most significant change didn’t take place until 2002, when the Rockford U Club became the last University Club in the nation to accept female members, breaking its 91-year tradition. “It was pivotal for our survival,” Schiffer says. Today, there are nearly 70 female members. Hill says opening the club to women made good sense for many reasons. “It’s doubled the pool of potential members, which was a smart move,” she says. “And it’s broadened the type of events the club presents.” While Rockford’s University Club is unaffiliated with any other club, its members have reciprocal privileges with other University Clubs across the nation. In addition to discounting membership fees this year, club members have been celebrating this milestone anniversary year with special events including a springtime tea, open house, Fourth of July picnic and centennial dinner. In December, the club will hold a final celebration called Tara’s Holiday Tea, hosted by member Tara Blazer. Another smart move was renovating the building. In 2007, club members approved an $800,000 plan to remodel all three floors of the club, as well as upgrade the heating and cooling system and install an elevator. The bar area was expanded; cosmetic changes were made in the living room and dining room; landscaping was improved; a women’s locker room was built in the basement; and second-floor spaces were reconfigured to allow for large meeting rooms. Lunch is served daily, dinner on Monday, Thursday and Friday nights. The menu varies from prime rib dinners to fish fries. If asked, Chef Jason Kovanda will even recreate the club’s most famous dish: the cowflop, a large omelet that dates back to the 1950s. The University Club also believes in giving back. Since 1950, it has awarded scholarships to one, two or three high school seniors each year. Students are chosen from public and private schools in Rockford and Loves Park, and selection is based upon grades, essays and extracurricular activities. Each scholarship amounts to a total of $6,000 over four years. As the centennial celebration winds down, members of the University Club are gearing up for the next 100 years. This entry was posted on Friday, October 14th, 2011 at 12:00 pm	and is filed under Recreation & Destinations, Top Posts. You can follow any responses to this entry through the RSS 2.0 feed. Both comments and pings are currently closed.